D.C. Council Chairman Phil Mendelson (courtesy Josh Gibson). The D.C. Council has the chance to pass the most extensive paid family leave bill in the nation. The proposed Universal Paid Leave Act of 2015 gives D.C. workers and residents 16 weeks of paid family and medical leave, excluding federal government employees. The bill has gone through three lengthy council hearings since it was introduced on October 6, 2015. 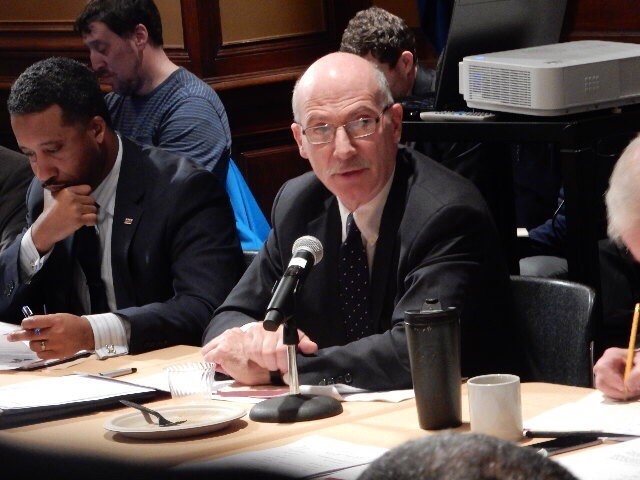 And on Feb. 8, following feedback from the opponents and supporters, Council Chairman Phil Mendelson released a discussion draft, an alternative version of the bill, for consideration alongside the original bill. The discussion draft scaled back the proposal to 12 weeks of leave and dialed down the amount of workers the bill covers to only D.C. workers, so that D.C. residents that work outside the District are no longer covered. Mendelson’s draft also proposed changing the definition of family under the bill. According to Sekerci, the bill’s definition of family was narrowed to exclude the parents of workers. Mendelson’s proposal reads, “the discussion draft narrows the definition of family to include only legal relationships”. Legal relationships are defined in the bill as a person to “whom the eligible individual is related by legal custody.” This would not include parents because children do not have custody over their parents. “For example, when your parents get older and you want to take care of them when they’re getting sick, legally you wouldn’t be able to take leave because they wouldn’t be defined as family,” Sekerci said. The discussion draft also changes the amount of compensation for workers who take leave. The discussion draft also changes the amount of compensation for workers who take leave. “There was supposed to be 100% reimbursement for your wages if you earned $50,000 or less, and they switched it to 90%, which doesn’t seem like much, but when you’re earning minimum wage it makes a huge difference,” Sekerci said. Sekerci was one of hundreds of witnesses who flooded the D.C. Council chambers for multiple public hearings on the bill. Many of the bill’s backers, including Sekerci, are part of a coalition organized by Jews United for Justice, which has led the charge in promoting the bill, according to the group’s communication director, Rebecca Ennen. Ennen is also in support of the original 16-week-bill over the discussion draft. “We think that the original bill was really strong and we were totally behind it. The new bill cuts out too many people, and needs to be expanded back,” Ennen said. While supporters push for reversing cuts made to the bill, others want to see it further scaled back. The main opponents of the bill are the Restaurant Association of Metropolitan Washington and the D.C. Chamber of Commerce. Both groups argue that such a bill will make the District less attractive to new businesses and more difficult for current businesses. According to Kathy Hollinger, head of the Restaurant Association of Metropolitan Washington, the bill would put too much pressure on restaurants. It is unclear whether Hollinger’s fears are founded, because the total cost of implementing paid leave on this scale is unknown. If passed, this bill would provide the most expansive paid leave program in the country. “It would totally put D.C. on the map, in terms of paid family leave legislation and progressive legislation in general,” Sekerci said. How much will this paid leave program cost? There has been dispute about the cost of the bill since the last hearing in January, where two experts presented contrasting analyses on the potential cost. During a Jan. 14 D.C. Council hearing, Heidi Hartman, head of the Institute for Women’s Policy Research, presented the results of a study claiming the program would cost around $281 million. According to Hartman, that figure could be covered by a 0.63 percent payroll tax. James Diffley, the senior director of IHS Economics, a company that provides economic analysis to corporate clients, offered a very different look. That uncertainty over the cost and other points of contention drew over a hundred people to testify at the Feb. 11 D.C. Council hearing, which lasted 8 hours. Some witnesses, like Patricia Harrell, back the bill after drawing from their own experiences.